Objectives To investigate the relationship of socioeconomic status (SES) on an individual and country level with disease activity in rheumatoid arthritis (RA) and explore the mediating role of uptake of costly biological disease-modifying antirheumatic drugs (bDMARDs) in this relationship. Methods Data from a cross-sectional multinational study (COMOrbidities in RA) were used. Contribution of individual socioeconomic factors and country of residence to disease activity score with 28-joint assessment (DAS28) was explored in regression models, adjusting for relevant clinical confounders. Next, country of residence was replaced by gross domestic product (GDP) (low vs high) to investigate the contribution of SES by comparing R2 (model fit). The mediating role of uptake of bDMARDs in the relationship between education or GDP and DAS28 was explored by testing indirect effects. Results In total, 3920 patients with RA were included (mean age 56 (SD 13) years, 82% women, mean DAS28 3.7 (1.6)). After adjustment, women (vs men) and low-educated (vs university) patients had 0.35 higher DAS28. Adjusted country differences in DAS28, compared with the Netherlands (lowest DAS28), varied from +0.2 (France) to +2.4 (Egypt). Patients from low GDP countries had 0.98 higher DAS28. No interactions between individual-level and country-level variables were observed. A small mediation effect of uptake of bDMARDs in the relationship between education and DAS28 (7.7%) and between GDP and DAS28 (6.7%) was observed. Conclusions Female gender and lower individual or country SES were independently associated with DAS28, but did not reinforce each other. The association between lower individual SES (education) or lower country welfare (GDP) with higher DAS28 was partially mediated by uptake of bDMARDs. In rheumatoid arthritis (RA), previous studies over the last two decades in different countries have documented the presence of health inequities across the individual socioeconomic determinants of disease outcomes, namely age, gender, socioeconomic status (SES) (individual or defined by level of local area deprivation) and ethnicity.4–7 However, to our knowledge, only one study, Quantitative Patient Questionnaires in Standard Monitoring of Patients with Rheumatoid Arthritis (QUEST-RA), specifically explored between-countries inequalities in health outcomes of patients with RA.8 This study documented large variations in clinical outcomes (the disease activity score with 28-joint assessment (DAS28) and its individual components), health assessment questionnaire (HAQ), and pain among 25 countires. A strong correlation between disease activity (measured with DAS28) and a country's gross domestic product (GDP) was observed, indicating that patients in countries with lower GDP tended to have higher DAS28. In addition, the study found that patients in lower income countries had lower uptake of biologics compared with more affluent countries (7.5% vs 25% in low vs high GDP countries), while uptake of conventional disease-modifying antirheumatic drugs (DMARDs) was at a similar level. However, QUEST-RA analyses on disparities in disease activity did not take into account the role of potential individual confounders, and data on uptake of medication and health outcomes were not formally related to each other. In our previous country-level study that included nearly all European countries, we showed that patients in lower income countries have substantially lower access in terms of availability, affordability and acceptability to treatments, and especially to new and costly drugs, namely biological DMARDs (bDMARDs). This might explain the variation in uptake of these drugs and contribute to health inequities in patients with RA.9 ,10 However, to better understand the impact of macroeconomic differences in healthcare organisation, also individual SES should be taken into account as it could be a factor that additionally contributes to inequities in access to care within the countries, thus reinforcing the socioeconomic inequities in health. The role of the macroeconomic context (ie, socioeconomic situation in the country) and the interactions between individual-level and country-level determinants, and their impact on RA outcomes, have not yet been explored. Multinational studies are essential to investigate health differences across countries and relationships with micro (individual level) and macro (country level) socioeconomic factors, but at the same time such studies are scarce due to high logistic complexity and costs. COMOrbidities in RA (COMORA) is a unique recent initiative that collected extensive patient-level data from 17 countries across the five continents, and currently provides, to our knowledge, the best available data to explore within-country and between-country differences and determinants of health of patients with RA. The objective of this study was (1) to investigate the relationships of country-level and individual socioeconomic factors with disease activity in patients with RA and (2) to explore the potential mediating role of uptake of costly biological treatment in the relationship between SES (both country and individual level) and disease activity. COMORA investigators collected data on socioeconomic and lifestyle characteristics (age, gender, level of educational achievement (primary, secondary or university), marital status (single, married, widowed or divorced)), smoking status (past, current, never smoked), weight (kg) and height (cm). Body mass index (BMI) was computed and classified into underweight (BMI<18.5), normal weight (18.5≥BMI<25), overweight (25<BMI≤30) and obese (BMI>30).13 ,14 Furthermore, data on past and currently present comorbidities were collected, namely presence of ischaemic cardiovascular disease (myocardial infarction, stroke), cancer (colon, skin, lung, breast and uterus for women, prostate for men, and lymphoma), gastrointestinal diseases (diverticulitis, ulcers), infections (hepatitis), lung disease (chronic obstructive pulmonary disease and asthma) and psychiatric disorders (depression). Based on this information, Rheumatic Disease Comorbidity Index was computed.15 ,16 This includes respiratory diseases, myocardial infarction, hypertension, diabetes, depression, ulcers or other gastrointestinal infections, fractures and cancer. As information on fractures was not collected, they were not included in the index, resulting in a possible score range between 0 and 8. Among RA-related clinical characteristics, data were available on tender 28-joint count (TJC), swollen 28-joint count (SJC), erythrocyte sedimentation rate (ESR), patient and physician global assessments, high rheumatoid factor (RF)/high positive anticitrullinated protein antibody (ACPA), presence of erosive disease, fatigue, HAQ and medication received (synthetic and biological DMARDs, non-steroidal anti-inflammatory drugs (NSAIDs) and glucocorticoids). Linear and logistic regression models were computed with DAS28 (continuous and dichotomised, respectively) as dependent variable, and age, gender, education and marital status as independent variables of interest and adjusting for potential clinical confounders RF/ACPA, erosive disease and comorbidities, where relevant. First, associations were explored in univariable models. Next, those factors that showed significant (p<0.10) association with DAS28 or that were confounders of the relationship between the main variables of interest and the outcome were entered in a multivariable model using manual forward procedure (cut-off p<0.05). Models were built on complete cases. The categorical variable ‘country of residence’ was added to the final model. The Netherlands (NL) was used as reference category as it was the country with the lowest DAS28 (table 1). Next, the country of residence was replaced by GDP (dichotomised; low if GDP≤US$(PPP) 20 000 and high if GDP>20 000; since this cut-off best discriminated between the two groups) to investigate the contribution of socioeconomic welfare to differences in DAS28. Improvement in R2 (model fit) of the two models that included either country or GDP was compared with each other and with R2 of the final model without these variables. Interactions between country (as categorical variable or grouped by GDP) and education, age and gender were investigated. Where interactions were significant (a priori defined as p<0.01), stratified analyses were performed. In total, 3920 patients with RA from 17 countries (range 30–411) were included in the COMORA dataset (table 1). Mean age of included patients was 56 years old (SD 13), 82% women. Thirteen per cent of patients were current smokers. Thirty-six per cent of patients reported primary education as highest level of educational achievement, and 25% held a university diploma. On average, patients had one comorbidity. Mean DAS28 was 3.7 (SD 1.6), at the country level ranging between 2.6 (NL) and 5.2 (Morocco), 60% of patients had DAS28>3.2 (country-level range 31–90%) and 20% had DAS28 >5.1 (country-level range 2–58%). Thirty-two per cent of patients were treated with bDMARDs at the time of data collection (range 3–74%). The number of complete and missing cases is presented in the online supplementary table S1. In fully adjusted models, women had 0.35 higher DAS28 compared with men, and lower educated patients had a 0.35 higher DAS28 compared with university graduates (table 2). Women and low-educated patients had 1.8 and 1.6 odds to have a DAS28>3.2, respectively (table 3). Age or marital status was not associated with DAS28 in the final models. On a country level, differences in DAS28, using the Netherlands as the comparator, varied from +0.2 (France) to +2.4 (Egypt), after adjustment for relevant confounders (table 2, figure 1A). Patients from Egypt and Morocco had 16.0 and 11.4 odds to have DAS28>3.2, respectively (again compared with patients in the Netherlands) (table 3). Notably, even among European countries, large discrepancies were observed: patients from Germany, Hungary, Italy and the UK had OR 2.2–4.5 to have moderate-to-high-disease activity compared with the Netherlands and after adjustment for individual factors. Interactions between country of residence and age, gender or education were after stratification either not statistically significant or not clinically relevant. Differences in adjusted average DAS28 between individual countries (A) (reference the Netherlands) and countries grouped by GDP (B). Estimates are derived from models adjusted for age, gender, education, high rheumatoid factor or anticitrullinated protein antibody, and comorbidities. Red line corresponds to the β-estimate from the model with dichotomised GDP, grey area indicates the upper and lower borders of CI. DAS28, disease activity score with 28-joint assessment; GDP, gross domestic product. When country variable was replaced by GDP group (low vs high), countries in the lower GDP group had 0.98 higher DAS28 after adjusting for individual socioeconomic and clinical factors (table 4, figure 1B). On the same line, patients in countries with lower GDP had on average 2.7 odds to have moderate-to-high-disease activity (DAS28>3.2) compared with high-income countries. Additional contribution of ‘country’ to R2 of the model with only individual socioeconomic and clinical factors was 0.15, and contribution of GDP to the same model was 0.08. No clinically relevant interactions between the level of socioeconomic welfare in the country and age, gender or education were detected. Uptake of biologics had a small mediation effect in the relationship between lower education and higher DAS28. Patients with lower education (vs those with secondary school or university diploma) had 0.42 units (95% CI 0.33 to 0.54) higher DAS28, and 0.03 (95% CI 0.00 to 0.03), or 7.7%, of this total effect was indirect and could be attributed to lower uptake of biologics (figure 2A). In the pathway between low GDP (vs high) and higher DAS28, 6.7% of the effect was mediated by the uptake of bDMARDs (total and indirect effect 1.01 (95% CI 0.91 to 1.11) and 0.07 (95% CI 0.03 to 0.10), respectively) (figure 2B). Mediating role of current uptake of biological DMARDs in the relationship between education and DAS28 (7.7%) (A) and in relation between GDP of the country and DAS28 (6.7%) (B). Estimates are derived from models adjusted for age, gender, high rheumatoid factor or anticitrullinated protein antibody, comorbidities and GDP (A) or education (B). DAS28, disease activity score with 28-joint assessment; DMARDs, disease-modifying antirheumatic drugs; GDP, gross domestic product. The purpose of this study was to investigate the relations between country and individual SES with disease activity of patients with RA, as well as explore the potential mediating role of uptake of costly biological treatment in these relationships. We found that lower educated individuals and women had systematically higher DAS28 (0.35 points higher on DAS28 scale for each of the factors) and higher odds to have DAS28≥3.2 (OR 1.58 and 1.78, respectively), while age or marital status had no relevant influence on disease activity. Further, DAS28 varied greatly between the 17 countries, after adjusting for individual demographic and clinical factors, and these differences reached 2.4 points in DAS28 (Egypt vs the Netherlands), which is highly clinically relevant.22 When countries were grouped according to GDP, we observed that patients in low GDP countries scored almost one DAS28 unit higher when controlling for other individual factors. Gender and education were previously found to be associated with RA outcomes (HAQ and DAS28 (only for education)) in a recent study that included patients from 14 countries in Latin America,4 and formal education was pointed as a factor associated with clinical outcomes in RA as early as 1988.6 In our study, we could not observe a relationship between age or marital status and disease activity, while Massardo et al4 have reported such associations. No other studies have reported on socioeconomic disparities in disease activity among patients with RA. In a recent study by Yelin et al,23 the authors analysed data on bDMARD prescriptions between 1999 and 2011 and reported that patients with lower SES (as measured by income) were less likely to be prescribed a biologic. We have observed that patients with lower SES (as measured by the level of education) had higher DAS28, but also detected a small mediating role of uptake of bDMARDs (approximately 8%) in this relationship. It appears that lower educated patients are not only less likely prescribed a biologic, but that the reduced access may contribute to worse disease activity and thus point at inequities. While our results are consistent with the findings on QUEST-RA, which also found a negative correlation between country GDP and DAS28 in unadjusted analyses,8 we can now conclude that these differences can only be partially explained by individual age, gender, SES, clinical parameters or comorbidities. In other words, our analyses were performed at the patient level, that is, taking each patient's DAS28 into account, thus advancing analyses beyond only correlating GDP and mean country DAS28. 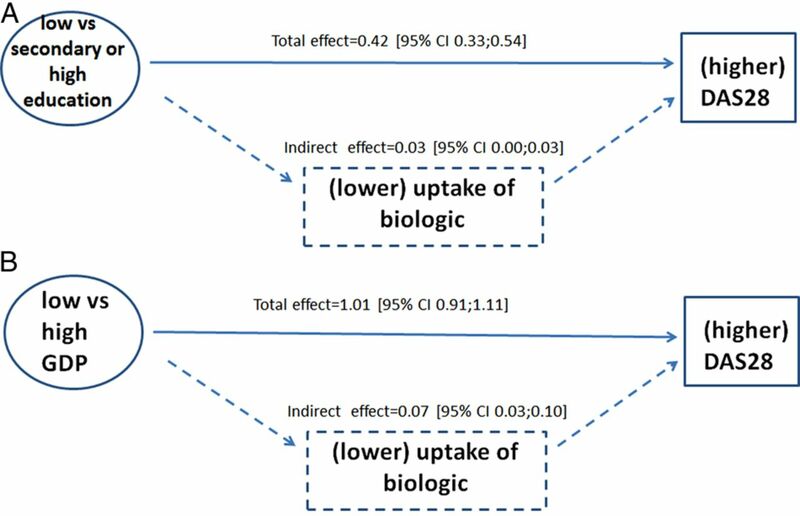 Previous literature suggested that uptake of bDMARDs could potentially be part of the pathway between low socioeconomic welfare of a country and higher disease activity, but this has not been formally tested.9 ,10 ,24 Mediation analysis revealed that about 7% of relationship between low GDP and high DAS28 was indeed mediated by uptake of these costly but effective medications. While this pathway explains only a relatively small share of the relationship, it may not be neglected. 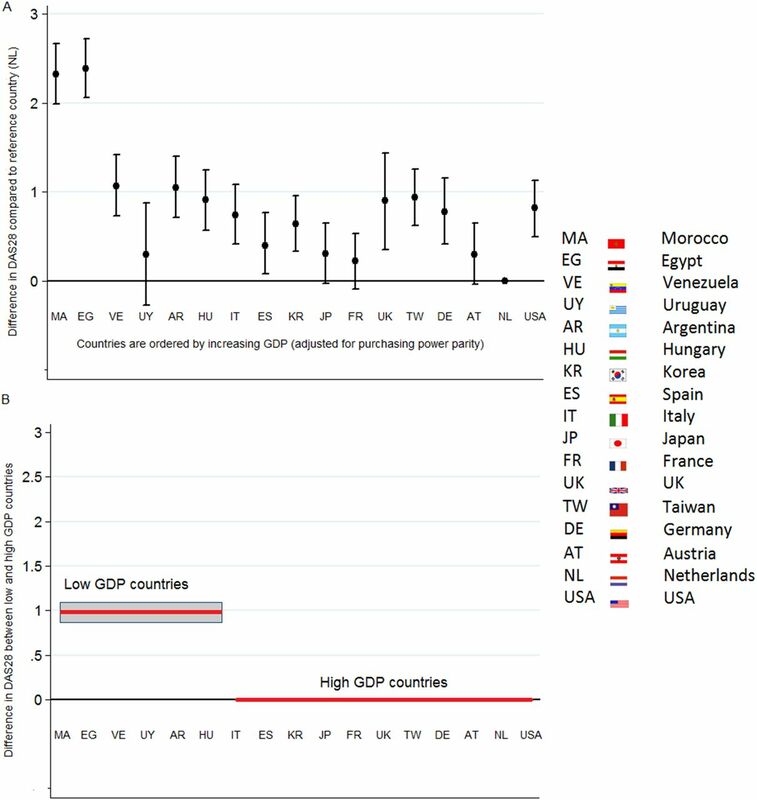 Comparing the model fits revealed that grouping countries by GDP has resulted in lower explanatory power of the model compared with the model including the different countries, indicating that GDP is only one of likely many factors contributing to disparities in health outcomes between countries. A number of other factors (such as number and access to rheumatologists, training and beliefs of rheumatologists, knowledge and implementation of tight disease control, presence of early referral strategies, cultural preferences in treatment choices, health literacy and likely others) should be considered in the future in more complex study designs and analyses, including structural equation modelling. We could not find evidence that the socioeconomic development of the country, measured as low or high GDP, and individual factors reinforce each other, namely, that in lower income countries patients with lower education or women or older age would be additionally disadvantaged. Instead, we observed that both low country-level and individual SES independently contribute to higher disease activity, and less access to bDMARDs could lie on the pathway in both cases. Some limitations deserve to be mentioned. First of all, the sample of patients may not always be generalisable to the general patient population in each country. It is possible that more remote areas were less likely to be reached, and furthermore, the sample is inevitably limited to patients who had access to the specialised rheumatological care. This potential selection bias might be more pronounced in low-income countries, and thus result in underestimation of the magnitude of the observed socioeconomic gradients in health. Next, we have used the GDP adjusted for purchasing power parities. While direct comparison of GDP converted in one currency is not meaningful, adjusting for PPP allows correcting for price levels across the countries (using standard basket of goods and serviced as a unit of account). This method, despite being seemingly simple and straightforward, is being criticised as defining a standard basket of services and goods for different countries is a great challenge because countries differ in their consumption patterns.25 Nonetheless, it is the most commonly accepted way to allow direct comparisons for GDP and was not previously used in these types of studies.8 Furthermore, GDP itself is an aggregated measure and can only be a remote proxy for the country's socioeconomic welfare, while expenditure priorities can be very different, including regional differences within the countries, which we could not account for. Next, cross-sectional design hinders conclusions about causality. However, education or country's welfare are relatively stable factors and most likely to have occurred before DAS28 was measured, thus indirectly supporting the cause–consequence relationship. Further, it is inevitably a large number of factors that contribute to worse health and disentangling the effects of different relevant factors requires prospective data collection, ability to measure aspects such as cultural acceptability of care and suitable statistical techniques. In the current study, we were able to perform a mediation analysis to get insight into possible pathways between the socioeconomic factors and health outcomes, which is one step further than simple associations. Last but not the least, decision on adjusting or not the (mediation) analyses for other medication (synthetic DMARDs, NSAID and/or glucocorticoids) was not straightforward. We have decided to not adjust for glucocorticoids as descriptive analyses revealed that patients in countries where biologics are not widely prescribed receive glucocorticoids more often, and vice versa.12 Thus, adding glucocorticoids to the model would lead to overadjustment. NSAIDs did not show to be related to the outcome, and thus were not considered in final models. Patterns on prescription of synthetic DMARDs (methotrexate) did not differ across countries, and thus this variable was also excluded from the models. To assess potential bias introduced by these decisions, we also repeated mediation analyses adjusting for all three types of medications listed above, and the proportion of effect that was mediated did not change (data not shown), which confirms the robustness of the results. Our study is among the first that collected sufficient unified data from many countries and a large number of patients with RA across the world, thus allowing detailed patient-level and country-level analyses of socioeconomic gradients in health of patients with RA. While socioeconomic determinants of health is an issue that receives increasingly more attention in a globalising world, available evidence is very limited, our study being one of presently only a handful in the field of rheumatology. In conclusion, we found that lower individual or country SES are independently associated with DAS28 in patients with RA, but do not reinforce each other. Association between lower individual SES (education) or lower country welfare (GDP) with higher DAS28 could be partially mediated by uptake of bDMARDs. However, it is apparent that many factors contribute to this relationship and these should be explored in future to identify avoidable factors that can be tackled to reduce inequities. The authors would like to thank the national principal investigators of the COMORA study: Gustavo Casado (Argentina), Josef Smolen (Austria), Bassel Kamal El-Zorkany (Egypt), Martin Soubrier (France), Gerd Burmester (Germany), Peter Balint (Hungary), Carlo Maurizio Montecucco (Italy), Masayoshi Harigai (Japan), Yeong-Wook Song (Korea), Najia Hajjaj-Hassouni (Morocco), Mart van de Laar (the Netherlands), Emilio Martin-Mola (Spain), Shue-Fen Luo (Taiwan), Jonathan Kay and Kevin Winthrop (USA), Gabriel Maciel (Uruguay), Anna Antunez (Venezuela); the scientific committee of COMORA study: Peter Balint, Gerd Burmester, Paul Emery, Jonathan Kay, Emilio Martin-Mola, Iain McInnes, Carlo Maurizio Montecucco and Josef Smolen; patients who agreed to participate in this study.
. Developing the policy response to inequities in Health: a global perspective. In: Challenging inequities in health care: from ethics to action. New York: Oxford University Press, 2001:309–22. WHO. Obesity: preventing and managing the global epidemic. Report of a WHO Consultation. WHO Technical Report Series 894. Geneva, 2000.
WHO. Physical status: the use and interpretation of anthropometry. Report of a WHO Expert Committee. WHO Technical Report Series 854. Geneva, 1995.
. The measure of GDP per capita in purchasing power standards (PPS): a statistical indicator tricky to interpret. OECD working paper, 2002. Contributors AB has conceived the idea for the manuscript. APK has provided advice on statistical analyses. PP, SR and AB have conducted the analyses and drafted the manuscript. All authors contributed to the interpretation of the results, reviewed and approved the manuscript before submission. Funding Data collection was supported by an unrestricted grant from Roche LTD. The ancillary study described in this manuscript was done without any type of funding. Ethics approval The protocol for original COMORA study was reviewed and approved by all local institutional review boards or ethics committees (in each of the 17 participating countries).